17 years old I got my first license in 1982 it was T class. With T class license I was allowed to work on frequencies from 144 MHz and up. In 1984 I got a class B license. At that time I had no antennas for HF at home so I worked from our club station SK2HG, only CW was allowed with class B licence. In 1985 I got my class A license (highest class in Sweden) from that time I was allowed to work on the HF-bands with no limitations. 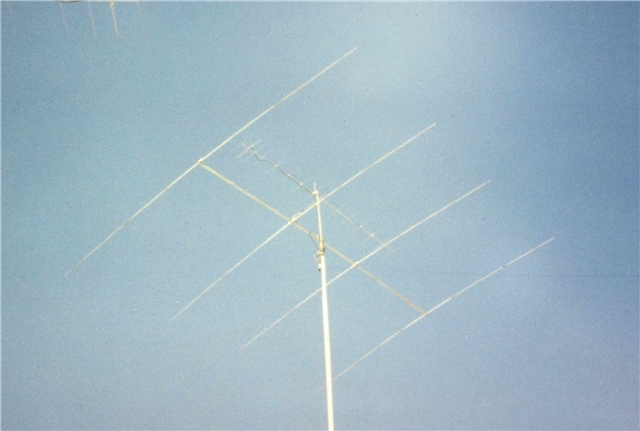 At Christmas time 1986 I had finished a 20 meter high mast and put together a 4 element monoband yagi for 20m that i borrowed from SM2EJE. One year later by the end of 1987 I had worked my first 200 DXCC countries.1988 I bought a new KLM KT34XA (6 el 3 band) and worked another 50 countries that year. By the end of 1989 I had worked 275 countries. Then from spring 1990 I moved and went QRT. During the period from 1990 to 2004 I only worked a few times from my summer house IOTA EU-139 and no new DXCC:s. At spring time 2004 my interest was woken up again and I put up my vertical (R7) again and started to work some QSO:s on the HF-bands. I also put up a vertical for 20m at my summerhouse and worked about 1000 QSO:s (IOTA) during the summer. In September I had raised a new tower at Home and put up my old KLM 3-bander again . I started to sort out my QSL:s for DXCC and found that lot of them was not confirmed. I had to work those countries again to get them confirmed. I found out that it is much easier to work new countries today compared to the late 80:s probably because it is much more activity around the world. By the end of 2004 I had worked most of the unconfirmed countries again and another 15 new ones. Homemade 4-element monobander for 20 m with 8 m boom. 15 element CUE DEE for 2 m on top.